This Traditional Shepherd’s Pie is a British comfort food classic loved by all. Ground lamb is cooked with vegetables and Guinness for an extra flavor boost, then topped with fluffy mashed potato and baked. Real shepherd’s is made with ground lamb and not beef. The name makes sense if you think about it. Lamb is a sheep and a shepherd is a person who tends to sheep, hence the name. I like to add Guinness to my traditional shepherd’s pie. Over the years of making this, I found that the rich flavor of the beer gives it that extra depth of flavor you just cannot get without it. You can omit if you are cooking for children and substitute with more beef stock. Why is it called a shepherd’s pie? The pie made with beef is traditionally called cottage pie, made by the poorer people who lived in cottages from leftover beef. Both pies derive from the 18th Century, but as time has gone by, beef has becoming increasingly popular and more widely used than lamb, and so the recipe using beef is now commonly known as shepherd’s pie. The topping is made using mashed Yukon gold potatoes as they make for soft and creamy mashed potato. I have been known to add a small rutabaga to the mash which takes it to a new flavor level, if you would like to try. As an extra bonus, the dish makes a little gravy as it cooks so you can reserve it and use for spooning over the top when serving. I like to make this recipe in a 10-inch cast iron skillet (or oven-proof sauté pan) that be transferred to the oven. If you don’t have a cast iron or oven-proof skillet, you can start this recipe on the stovetop in whatever pan you have that will work then transfer to a casserole dish of about the same size to finish in the oven. Does shepherd’s pie freeze well? Yes! You can freeze before baking (just allow to cool) and cover tightly. It will keep frozen for up to 2 months. When you are ready to make, defrost in the fridge overnight then bake as per the recipe instructions. To freeze leftovers, allow to cool and wrap them up well. To reheat, you can bake right from frozen at 350°F for 1 hour. This dish is also a perfect make ahead meal. Just make up to the point of baking, but don’t bake. Allow to the dish to cool, cover and refrigerate for 3 to 4 days. When ready to serve, preheat oven to 350°F and bake for 25 minutes until the top is browned. 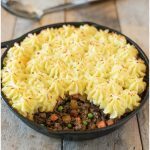 If you’ve tried this Traditional Shepherd’s Pie or any other recipe on the blog then don’t forget to rate the recipe and let me know how it turned out in the comments below. I love to hear from my readers! Ground lamb is cooked with vegetables and Guinness for an extra flavor boost, then topped with fluffy mashed potato and baked. To a large pan add the potatoes, add cold water until the potatoes are covered and bring to a boil. Turn down to a low boil and cook for 20 minutes until tender. Drain the potatoes a colander, and add back to the pan. Mash until smooth and add the butter, milk, salt and pepper to taste. Mix well and set aside. Add vegetable oil to a 10-inch cast iron skillet over medium-high heat and add ½ of the ground lamb. If the pan is too crowded, the meat will not brown, it will boil. Season with half of the salt and pepper, sauté until browned, breaking up the meat as it browns. Drain the meat keeping the fat in the pan and transfer to bowl or plate and repeat with the other ½ of the lamb, salt and pepper. Turn the heat down to medium and sauté the onions for about 5 minutes until softened. Add the garlic and thyme, cook for 3 minutes. Add tomato paste and mix well. Add the carrots, parsnip, peas, Guinness, Worcestershire sauce and beef stock. Simmer for 20-25 minutes until the liquid has reduced and the carrot and parsnips are tender. Taste for seasoning and add salt and pepper if needed. Turn off the heat. Spread the potato mixture (or pipe with a piping bag for a decorative look) over the beef mixture. Make sure you make little peaks so they get a nice brown color in the oven. Place the pan onto a baking sheet and bake in the oven for 25 minutes or until the top is golden brown. Made this last night. Delicious and rich with the tomato paste and Guinness (my wife doesn’t like onions and parsnips in her pie. Guess I’ll have to mansplain the significance of root vegetables in traditional Irish cooking. Also saw a video recipe for Chicken Tiki Masala while on this site that looks too good to pass up. I’ll be trying that next week. Thanks for the recipes. Made this after buying ground lamb on a whim… Never used before. I cooked the lamb as instructed qnd tasted before assembling for the oven. Was so surprised how good it tasted as is. I’ve had lamb chops and shanks but never ground. It was a great dish that was simple enough to make quickly for weeknight dinner. Will make this again soon. I’m so glad you enjoyed the shepherd’s pie. Thank you for stopping by and leaving feedback. I made this but substituted a few ingredients because I don’t like lamb and still turned out delicious. I love that you made it your own and enjoyed it. Thanks for the feedback. What are appropriate side dishes? I’m not really sure they are necessary, just curious if traditionally what was served with it if anything. I don’t serve it with any sides as there are vegetables in the with the meat and there is the mashed potato. I hope this info helps. Thank you for your question. In the body of the post, I mention that Guinness is a rich flavored beer that can be omitted if you are feeding children or for other reasons. I hope you make the recipe and enjoy, it is one of my most popular right now. Amazing. Definitely my family’s new favorite. I’m so glad Nancy, thank you for stopping by to leave the great feedback. Hi! I made this over the weekend and it was FABULOUS!! Have you ever made it and frozen it before baking? I’d love to be able to make them for easy meals later or even as gifts!! You have made my day! Thank you and I’m so glad you loved it. I haven’t frozen one, but they do freeze well and I think freezing before baking is a great idea. For the baking instructions, I would take it out of the freezer the night before baking. Allow to defrost in the fridge overnight, then bake 25 minutes as the recipe suggests. This is a very nice recipe, made it tonight, used 2/3 lamb 1/3 beef and add two stripped cobs fresh corn because it’s in season. Delish! I’m loving that you mixed in the lamb and corn. So glad you liked it. It doesn’t mention when to add the meat back into that pan after the step to brown 1/2 and then the other 1/2, when do I return the meat to the pan? Hi Tim, the meat get returned in step 6 with the vegetables. The recipe has been updated, thanks! My grocery store had ground lamb so I decided to try it. I found your recipe and I am so happy I did. It was so delicious. I want to make it again even though it was dinner. The Guinness really pulled it all together. We usually make Shepard’s pie with the beef. Thanks again! I’m so glad you tried the traditional lamb version Christina, thanks for the feedback. I would love to give this recipe a try! This looks wonderful. 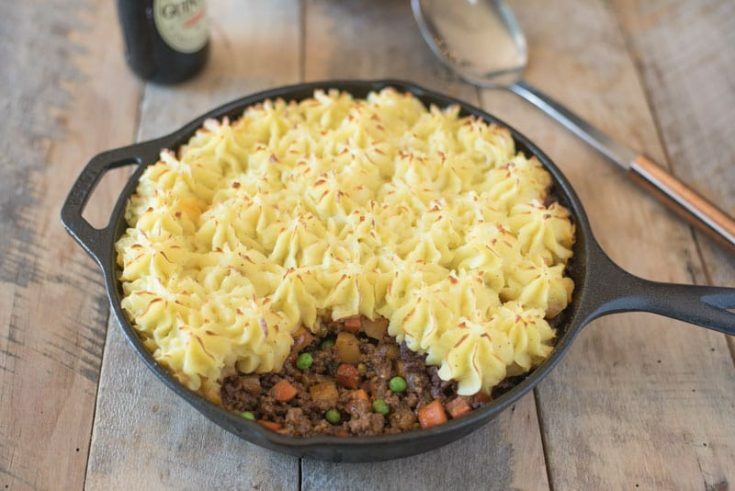 I’ve made shepherds pie, but only with beef and no Guinness, so I will definitely have to try this. I’m not so great at piping, yours looks beautiful, so I may give that a try. Another option I may try when back in the U.S. Is with Bison. I really love shepherd’s pie, and cottage pie as well but lamb wins over beef for me! Yours looks so good! I love a good shepherds pie and this one looks like a winner to me. I’m going to make this asap! The potatoes on top look beautiful! What a fun twist on a traditional recipe. Shepherds Pie is such comfort food. Perfect for getting us through the last bit of winter. Love how you piped on those potatoes too – so pretty! I’m pretty sure that Shepherd’s Pie is one of my favorites, but I don’t make it often enough! Yours looks great, and I can’t wait to make it. So comforting, so yummy!